Kagoshima prefecture office will be unveiling new rubber stamps. The stamps will be located on the first floor entrance. Commemorative rubber stamps are very popular in Japan and every tourist attraction will have rubber stamps for you to stamp in your journal. 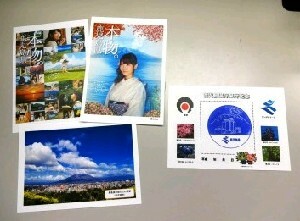 Two of the new stamps will be using the poster designs which featured Yukirin for promoting Kagoshima as imprints.